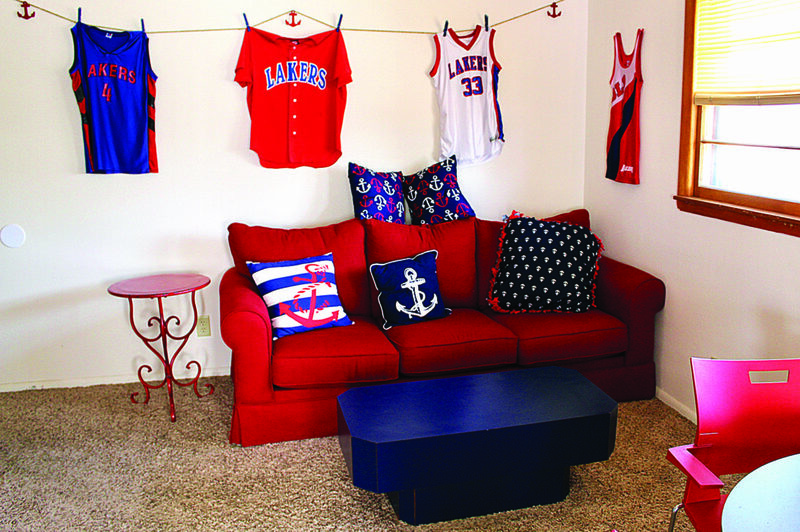 Coaches from Des-Lacs Burlington High School gave Deanna Wille different jerseys from different eras to decorate The Laker Zone in Burlington. BURLINGTON – Deanna Wille started The Laker Zone in Burlington last year as a place for the community to come together and enjoy delicious, nutritional drinks in their own backyard. Wille had been going to different nutrition clubs in Minot and noticed that other residents in the Burlington area were doing the same. Eventually, she decided she would open a nutrition club of her own with Herbalife products in Burlington. She found what is The Laker Zone today as a house for rent that was zoned commercial behind the Cenex on Johnson Street. With commercial space hard to come by in Burlington, Wille was thrilled. One call to the property management and one call to the city later, Wille had the okay to bring the shop and hangout to Burlington. The Laker Zone is located at 109 Second Avenue West. 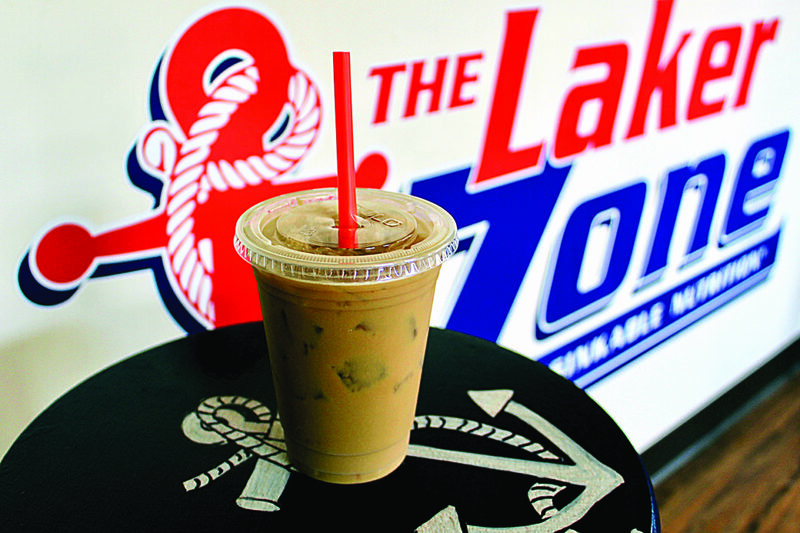 The Laker Zone, located at 109 Second Avenue West in Burlington, has started selling iced protein coffee made with With Room Coffee’s cold brew. The community in Burlington has wrapped their arms around Wille and The Laker Zone and has helped it become a hidden gem of the area. Coaches from Des Lacs-Burlington High School brought over some Laker gear to decorate the space with old uniforms and memorabilia. “The volleyball players and basketball players will all come and get shakes before their games,” Wille said with a smile. Not only for the Lakers, members of the Minot High girls swim team recently had some team bonding at the little shop in Burlington. At The Laker Zone, guests can find protein shakes, energizing tea bombs, teas and shots of aloe. Some of their fun flavors include French Toast, Blueberry Muffin, Scotcharoo, Chocolate Cover Strawberry and many more. Recently, Wille partnered with With Room Coffee to bring their cold brew to Burlington to make protein coffee drinks. Wille went to work right away seeing what protein mixed best with the coffee and working on recipes to use at The Laker Zone. Becca Alvarez and Vilandre also worked with Wille, sharing their recipes to help create the best product possible. Thursday and Friday were the first days that the shop sold their protein coffee drinks and Wille said they had completely sold through all of the coffee. The protein iced coffee is available in vanilla, hazelnut, caramel and the Orange White Mocha from With Room Coffee. While all the drinks are made with their cold brew, the Orange White Mocha uses the same recipe between the two businesses, except Wille adds Herbalife protein at The Laker Zone. These two business have teamed up to make their dreams a reality together. Along with the drinks, Wille is also an Herbalife distributor and sells the protein at the store so guests can make their drinks at home. Gregory Booker, right, of Acacia Lodge No. 12, presents a $500 check to Jill McDonald, director of the Minot Domestic Violence Crisis Center. Gregory Booker, right, of Acacia Lodge No. 12 presents a $500 check to Louis Mcleod, director of the Minot Homeless Coalition. Elizabeth Bledsoe, Noah Kirk and Sarah Patten from the Olive Garden in Minot deliver lunch to the Minot Police Department on Monday, Labor Day. All 850 Olive Gardens in the country delivered meals to local first responders on Monday.